Tiny Toes in SoCal Sand: Setting Up Mother Goose Time...Here We Go! 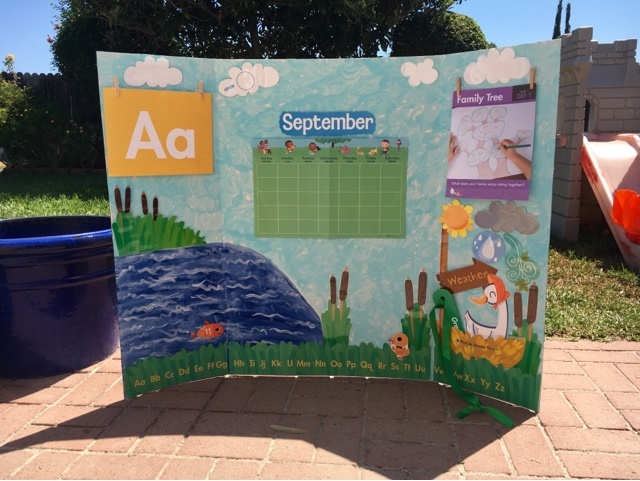 It is finally time to set up our Mother Goose Time area and display for the year! 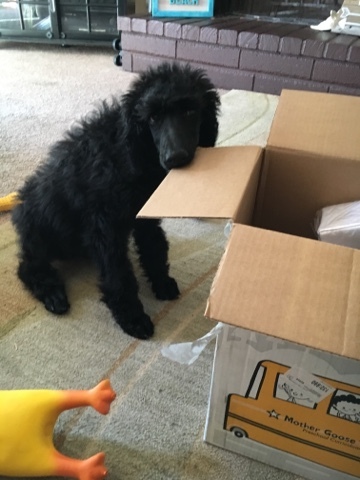 Our September box arrived and was welcomed immediately by the kids and our new puppy, Jack. 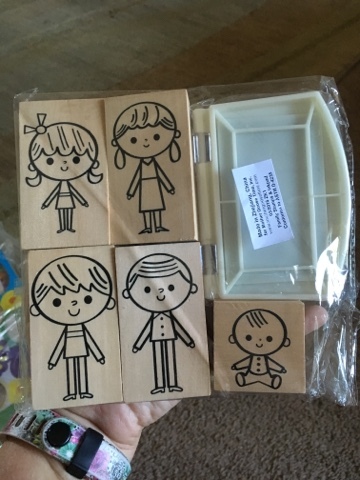 The first box comes with all of the display items needed for the year, such as the circle time things and the alphabet. First I took everything out and laid it on the ground. 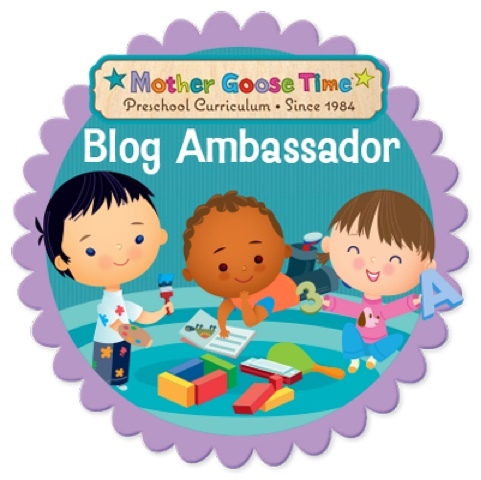 Strong B was so excited because he knew that now Mother Goose Time (MGT) is his only curriculum! 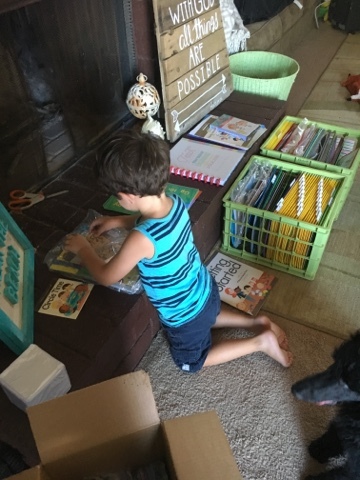 He isn't attending preschool anymore, and he knows that he has so much learning in store for him this year after watching Tiny B learn so much last year. 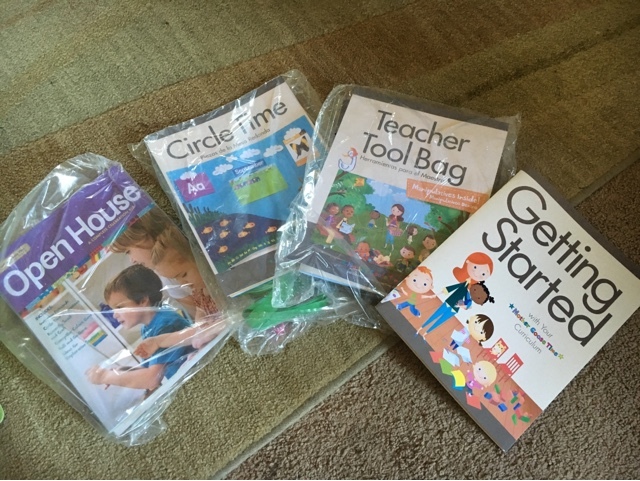 Tiny B is in kindergarten this year and I'm homeschooling her three days a week and she attends her public charter school two days a week. Strong B dove into the bags and got excited over absolutely everything, and was especially intrigued by the stamps. I laid out the bags and filed what needed to be filed and separated what needed to be hung. The "Getting Started" book told me exactly what to do, where to hang things, etc. 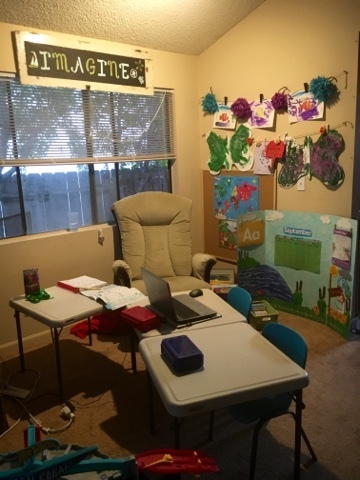 I could be as creative or uncreative as I wanted, and either way, my classroom area would turn out adorable and effective. I was so happy to see the portfolios are included this year. I believe they removed them last year, but listed to feedback and added them back in. What a fabulous way to track their development as well as keep an adorable reminder of the fun and beautiful times had in their year. I bought a white tri-fold science board and painted the background. This did add extra time, but it was therapeutic for me. How often do I just get to paint? Not very often. I followed the set-up that MGT gave me in the book almost exactly, with the exception being the weather area. I chose to include all of the weather pieces at one time and I'll have them just point to the weather of the day. I find that removing them just doesn't work for us (and I love in sunny SoCal, so what can I say...). MGT gave us a choice of starting with the number 1 or 11, and I chose 11 given that both B's are ready for it. I really struggled as to where to put the MGT continent poster as well as the MGT theme poster, but I finally decided to put them on a bulletin board with double sided tape in my homeschooling area. Because we have a new puppy, I don't want to be using any tacks and I wanted the kids to be able to get to both posters easily. This area is basically my family room. Right next to it is the couch where we watch TV. 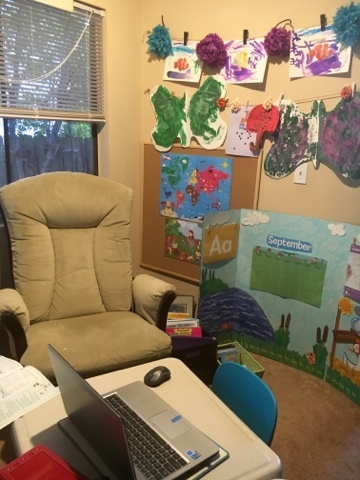 Years ago when I was majorly into home decor, I would have died having this stuff in my main room, and it honestly makes me cringe a little now, but homeschool is all about incorporating education into every part of our life, so why not have the homeschooling area in our main house area?! I bought the tables off Amazon and Costco, and they're easily foldable, as is my trifold board, so I figure when we really need a break, I'll put these this stuff away. It's worked out really well so far. 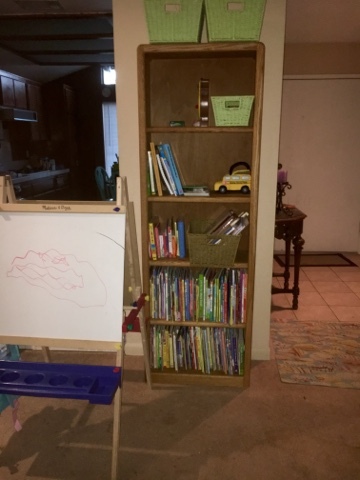 I put some books in this bookshelf right next to our homeschool area, and I'll keep their readers (easily decidable Bob Books, MGT readers, etc) here so that they can get to them easily. Every single one blew me away. 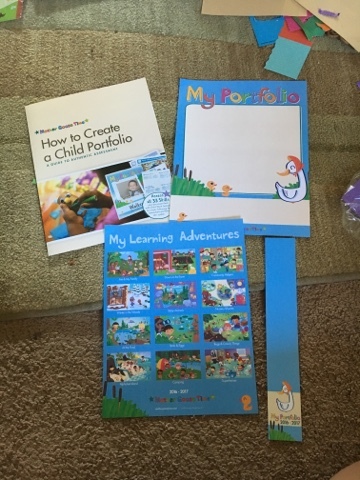 They really listened to their customers, but most importantly, they continued to do research and development and really considered best practices when it comes to early childhood development. 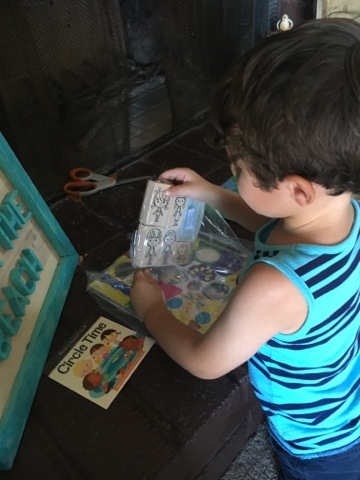 These reasons are why I love pre-made curriculum and why I'm highly unlikely to just go off the cuff in our homeschool journey. 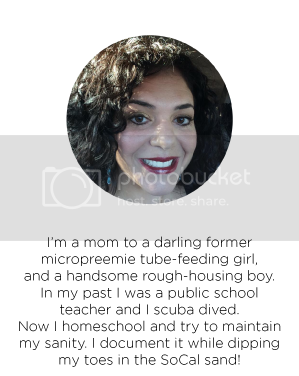 Please let me know if you have any questions about Mother Goose Time or homeschooling in general. This is quite a journey we're on, and I'm immensely thankful for this program as well as my homeschool friends who are walking this journey with me.